We believe that, almost without exception, all pupils can enjoy do well in mathematics by achieving a deep conceptual understanding in their formative years. Our teaching programme reflects the key findings of worldwide educational research. In the Lower School our teaching methods are based on the Singapore Mathematics programme through which pupils master concepts by using of objects/manipulatives (concrete) and drawings (pictorial) before engaging in written (abstract) work. Teaching in the Upper School follows the comprehensive Galore Park programme, which is a ‘teaching for mastery’ curriculum. Problem-solving is at the heart of our approach and an increasing emphasis is placed on pupils developing their critical thinking skills through the use of problem solving strategies including bar model drawing, systematic lists, working backwards, supposition, and looking for patterns. Pupils are encouraged to look for connections and to identify relationships. When used appropriately, IT can be a powerful tool for learning. Pupils have access to online apps such as ConquerMaths and Timestables Rockstars, and we continue to develop the use of IT in maths across the school. Pupils are encouraged to be independent learners but also to work collaboratively as this helps to develop their ability to explain, reason and argue. Most pupils need support and help at some stage, and their progress is regularly monitored using formal assessments and informally using learning journeys and classroom assessment tools. Parents are kept up-to-date about levels of effort and attainment and are encouraged to discuss their children’s progress with staff at any time. Pupils of all ages have the opportunity to take part in nationwide competitions such as the Primary Maths Challenge (Years 5 and 6) and the Junior Maths Challenge (Year 7 and 8). Additionally, selected pupils from Years 4 to 8 compete in team competitions against other schools including the UKMT Team Challenge in Years 7 and 8. 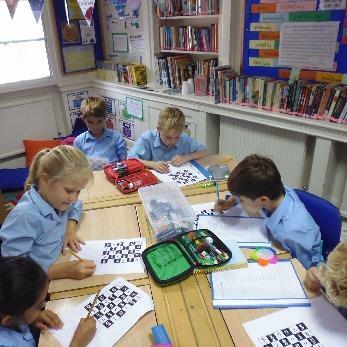 Popular weekly puzzle competitions not only encourage the development of mathematical skills, but also a life-long enthusiasm for the subject. 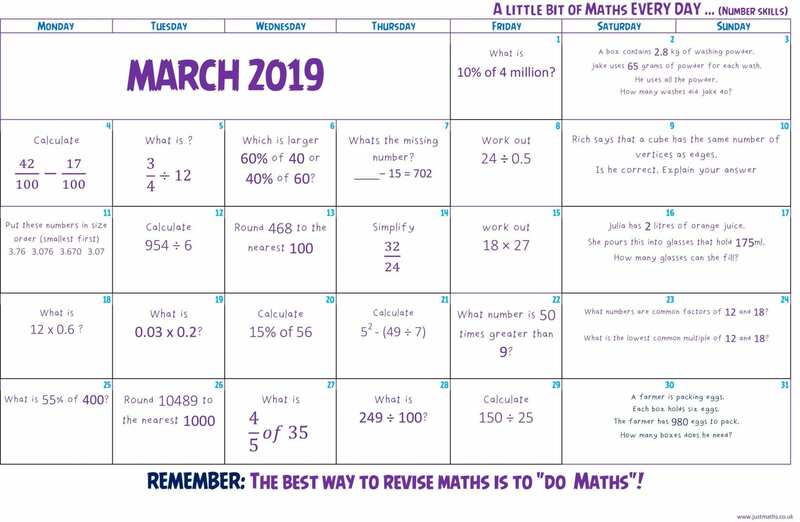 The monthly Maths Calendar has a different question for each day of the month. Students (as well as parents) can try to tackle these at their own pace. We would like parents to support their child’s learning and revision by encouraging them to answer one question per day.